January 20, 2012 (Westbury, New York) - In response to the growing recognition of past failures in the treatment of “untreatable” patients, Drs. 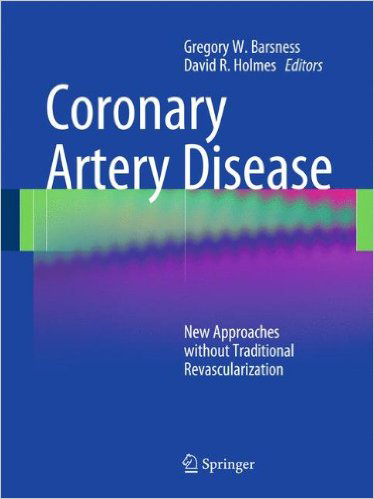 Gregory Barsness and David Holmes Jr. have edited the first textbook of its kind, as a framework within which a practicing clinician can expand on current practices and find insightful resources in dealing with the unmet need to provide treatment for the “unrevascularizable” but still symptomatic patient. Dr. Barsness is an Assistant Professor of Medicine and Dr. Holmes Jr. is a Professor of Medicine at the Mayo Clinic in Rochester, Minnesota. Dr. Holmes Jr. is currently the President of the American College of Cardiology. Included in the textbook is a chapter by Dr. Bradley Bart, Chief of Cardiology at Hennepin County Medical Center in Minneapolis, MN, on Enhanced External Counterpulsation (EECP®) Therapy. In this chapter, Dr. Bart thoroughly covers the initial development, clinical applications and possible mechanisms of action of counterpulsation therapy as currently used in the treatment of ischemic heart disease. Dr. Bart is also the Director of Clinical Programs at Hennepin County Medical Center, including nuclear cardiology, EECP® Therapy(enhanced external counterpulsation for the treatment of severe angina), therapeutic hypothermia for the treatment of cardiac arrest survivors, and ultrafiltration for advanced heart failure. Both Drs. Barsness and Holmes have been actively involved in clinical research and published articles demonstrating the safety and effectiveness of EECP® Therapy. They have also been involved in the program at Mayo Clinic providing EECP® Therapy as a non-invasive treatment option for their patients. Dr. Bart has been involved in clinical research, and published articles on the benefits of EECP® therapy in cardiovascular disease management. All three continue to be advocates of EECP® therapy for their patients. To get more information about or obtain the book, please click here.